As Vladimir Putin “turns the screws” on Russian public life in his third presidential term, Russian civil society is increasingly a repository for the ideologists and movers-and-shakers of an earlier age of Kremlin statecraft. Weeks ago, after the ouster of Vladislav Surkov (Moscow’s “grey cardinal”), observers from all over the globe proclaimed the end of an era in Russian politics. Last week, on May 22, 2013, when Surkov-ally Alexey Chesnakov quit United Russia and publicly criticized the party, few in the English-speaking world noticed, but the event could just as easily represent an important moment for Russian society. 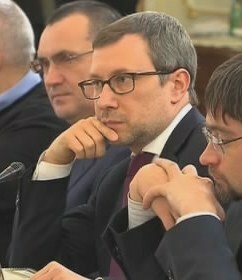 Alexey Chesnakov at a meeting between PM Vladimir Putin and political scientists, 6 February 2012, photo by Government.ru, public domain. Chesnakov is a case in point. Throughout Putin’s first two terms as president, he led the Administration’s information-analysis division, and later helped manage the Kremlin’s internal policy. Since 2008, Chesnakov has been a member of Russia’s Civic Chamber, held different leadership positions at the Center for Current Politics (TsPK), and served as a deputy secretary in United Russia’s General Council. (He also had a brief stint as a Kasimov city council member, in a failed bid [ru] for a seat in the national Senate, for which bloggers [ru] thoroughly condemned him.) In other words, Chesnakov has participated in public life on both the inside and outside of government, albeit always with a foot in the door, should he want to return either to public service or party work. After leaving the party so loudly last week, Chesnakov appears to have shut the door on United Russia. (The metaphor he later used [ru] was “burned bridges.”) In four separate interviews (all on May 22), Chesnakov laid out “stylistic differences” with United Russia, which it turns out involve ostensibly procedural gripes about how the party goes about drafting legislative initiatives. In all the interviews, he stressed the need for a two-party system that would subject United Russia to competition he says is necessary to preserve its vitality. Some of his other statements, however, lack a general coherence. For instance, Chesnakov argued in comments to Kommersant [ru] and Moskovskii Komsomolets [ru] that the Kremlin’s micromanagement hamstrings United Russia, but he told [ru] Slon.ru that one of the party’s most poorly handled legislative efforts (the ban on U.S. adoptions) was engineered exclusively by United Russia Secretary General Sergey Neverov. The day that Chesnakov announced his exit from United Russia, LiveJournal users added to the controversy with two separate (albeit dubious) allegations. First, blogger Mikhail Antonov obtained and published [ru] screenshots of Chesnakov’s friends-only Facebook posts from May 22. What caught the public’s attention was a long and flowery description of a culinary experience at a Paris restaurant. While Chesnakov later claimed this post referred to a past visit to France, some of his critics were quick to compare his resignation to Surkov’s foreign trip to the London School of Economics, where Surkov criticized federal investigators, possibly instigating his own ouster. “This is probably some new trend, making political announcements from abroad,” Olga Batalina (Chesnakov’s UR deputy secretary successor) joked [ru] to the media. Chesnakov’s think tank, TsPK, used to publish on its website weekly memos about Russian domestic politics. Those briefs often created waves [ru] among Russia’s chattering classes, such as an August 2011 memo [ru] speculating that Putin was moving to weaken his chief silovik, Igor Sechin. (All evidence suggests that things turned out otherwise.) The Center’s last weekly memo went live [ru] in early October 2012. Shortly thereafter, the website closed down [ru] for “reconstruction,” where it remains today. On May 22, 2013, Chesnakov told Kommersant that he would welcome his new nonpartisan status by publishing through TsPK a series of political papers about risks facing Russia’s political system over the next year of Putin’s presidency. Earlier today, May 28, he announced [ru] the upcoming release of 12 articles addressing problems facing United Russia. That content, however, will appear in TsPK’s side-project electronic periodical [ru], Topical Commentary.